After you finish college and work for a couple years but before you settle down and have kids, you might succumb to the wanderlust that makes people go expat. Maybe you have friends who have gone abroad. Maybe you were just too busy to do any traveling in college. No matter what the reason, living abroad is an amazing experience. Far more than just tourism, living abroad allows you to immerse yourself in another culture while also getting the keen view of an outsider. It can also make you highly attractive to prospective employers when you return to the states. Thailand might be the Chile of the east (or is Chile the Thailand of South America?). It's a reasonably stable and prosperous country with a low cost of living. Your grocery bill can come in at under $50 a month… if you're not one of those people who just ends up eating out at every single meal. What's more, medical care is modern, professional, and very inexpensive: Many expats give up their health insurance when living in Thailand, because routine medical care costs so little. It was also ranked as one of the best countries for foreign workers by expats. Here's one you'd probably never think of. However, it came in second, behind Thailand, in the HSBC poll of the best place for expats to live and work abroad. Here's something you probably didn't know: Bahrain is one of the most Westernized countries in the Arab world. This makes it the ideal destination for Americans and other Westerners who want to observe an Arab country up close. There are also copious jobs in the IT and technology sector, so if that's your gig, start looking for one in Bahrain. The cost of living isn't quite as radically lower as in some of the other choices, but it is cheaper than the United States. Are you an expat living abroad — if so, where? If you're considering living abroad, where have to considered living? I spent a little bit of time in China (Shanghai, Shenzhen & Guangzhou) last year and I was really impressed by it. The cost of living was much lower and the cities in which I stayed were all vibrant and exciting places to be. What about Costa Rica? I read that it is the most stable. Isn't Chile experiencing riots and such things? 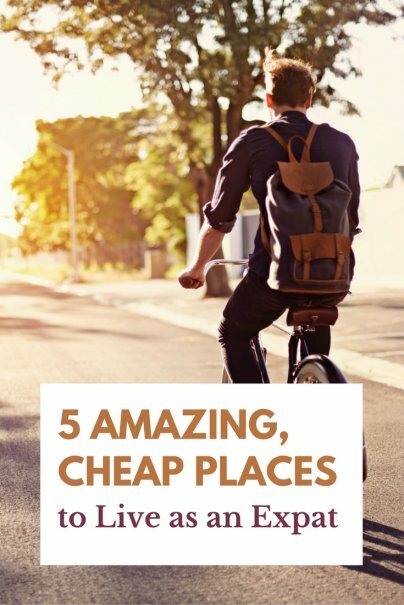 this article is a little misleading... you can live cheap in these countries if your frugal but 50 bucks a month in Thailand to eat? It's amazing how articles like this one never go into the issue of visas and residence permits. They make it sound like moving abroad is about as simple as moving from North Dakota to South Dakota. Take it from a life-long expat: it very rarely is. Hi Nick, I accumulated massive student loans at UMass Amherst studying discredited economic theory from pseudo radical professors who preach Marx to impressionable students during the week but check their 401k statements hoping that the S&P 500 climbs a few points by the end of the quarter. I also studied merdre like semiotics, Trotsky, Lacan and Foucault and thought I was really bright because I got good grades & lots of praise from said pseudo radical professors. A few years later I came to understand that I had made a series of horrible choices. I tried to make it as a writer, I was even writing shameful clickbait articles attacking successful rock stars and blogging for Fox News! It was barely enough to pay for my tattoos and modernist furniture. I am thinking of moving to another nation to avoid my student loans... Any advice? why don't you go to China or S. Korea and teach English and pay your loans off! How come no one ever writes about the Philippines when writing these expat stories. I've read lots of these, and never once seen any that suggest The Philippines as a low cost , exciting place to retire .